Front D rings are standard. Double D rings can be specified on the front. Two D Rings on right and/or left or 6 all round back. Also you can have a D ring for an air jacket fitted in the center of the cut back head as shown. If you need more comfort in the front of the saddle then we can provide this feature by specifying a “CC” seat. The skirts over the stirrup bars can be padded providing more support in front of the thigh lifting the riders fork off the front of the saddle. Used in conjunction with a “CC” seat greater comfort for ladies who suffer discomfort in this area. This is the ultimate for lady’s who suffer from saddle rub! We can create a channel from front to center of the seat so that there is no possible way of the seat applying pressure where it is not wanted. The silver plate on the back of the cantle can be covered in leather of the same or a contrasting colour. Seat are available on 16″, 17″, 18″ & 19″ trees. This seat is derived from the showing saddle seat. The seat is wider than the flat (square cantle jumping) and also has a small belly (support at the sides of the cantle. The back is square and on the curved tree profile feels deep. This seat is rather like the Shallow Seat Profile but has a larger area to sit on as the cantle does not end so sharply. Sizes – Seats are available in 16”, 17”, 18” & 19”. D Rings – Front D rings are standard. Double D rings can be specified on the front. Two D Rings on right and/or left or 6 all round back. “CC” Lady’s Seat – if you need more comfort in the front of the saddle then we can provide this feature by specifying a “CC” seat. Padded Wings – The skirts over the stirrup bars can be padded providing more support in front of the thigh lifting the riders fork off the front of the saddle. Used in conjunction with a “CC” seat provides the ultimate seat for ladies who suffer discomfort in this area. Covered Cantle Plate – The silver plate on the back of the cantle can be covered in leather of the same or a contrasting colour. Has a wider seat with more supportive ‘wrap around’ cantle and generous cup shape allowing more rotation of the pelvis with a support much further back that traditional saddles. Sizes – Seats are available in 16”, 17”, 18” & 19”. 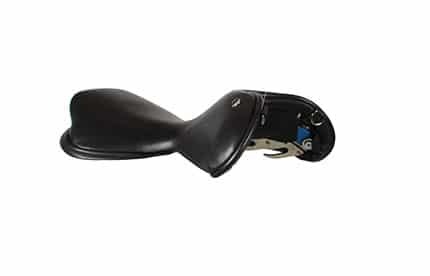 “CC” Lady’s Seat – if you need more comfort in the front of the saddle then we can provide this feature by specifying a “CC” seat. Has a very high round cantle with belly to give a deep supportive seat used mainly by dressage riders. Has a round high cantle with belly to give support and aid position. Used by dressage riders and show jumpers alike because the seat give a secure central feel. Has a round shallow cantle with belly to give support and aid position but gives enough room to slide back or over the cantle when jumping. Has a square cantle and no belly. This allows the rider to sit further back in the seat when necessary as it lacks the support at the sides of the seat. The Cross Country seat has a sloped cantle with no belly support and is shaped in such a way that even sitting right back on the cantle does not make the rider feel pushed away from the horse. This Seat will suit the Classical Dressage Rider that wants more room in the seat without constriction. The feel is a jumping seat in that it has a flatter middle that allows the rider to move their seat backwards or forwards more so than would be achievable in say an Extra Deep seat. The Academic seat benefits from a much higher cantle than the Flat Seat and therefore gives the support one would expect for dressage.